WANTED------ A Picture of a fixed keel Parker Dawson out of the water. 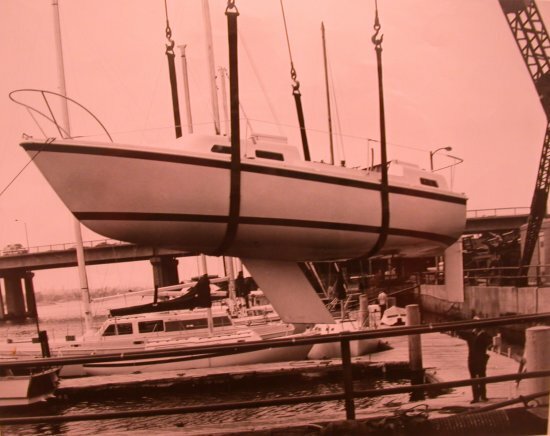 FOUND- A great early picture of a fixed keel going in- Sent by Beverly and Gary- Spirit of Annie Hull #84 here. See the great story of Conta, Hull #65 here. here. Catagories will be Keel, Motor, Sails, Rigging, Hull, Trailer and whatever elso comes in. 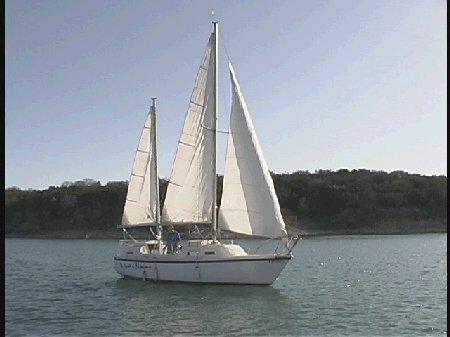 The Parker Dawson is a fiberglass hull, center cockpit, 26 foot saiboat. 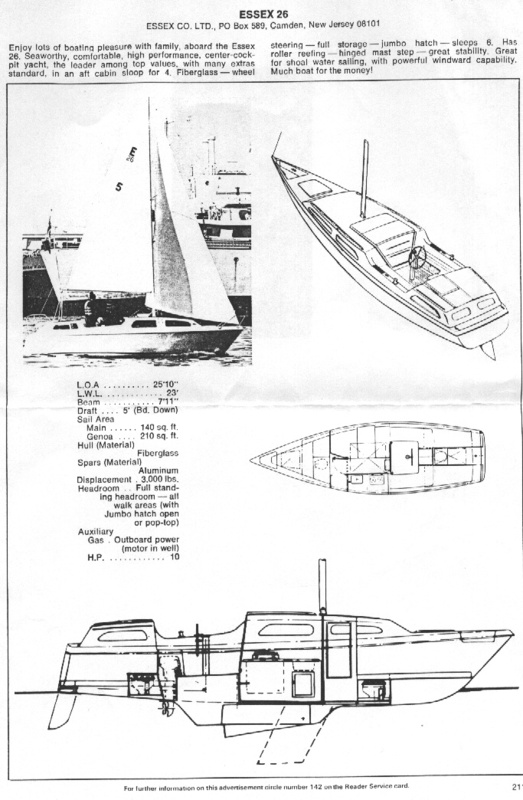 It was built under several different names: Midship 25, Dawson 26, and Parker Dawson 26, to name a few. The purpose of this site is to gather locations and hull numbers of Parker Dawson and related ships. If you own a Parker Dawson, e-mail me at the address found below. Aimed at the family market as well as the first-time sailor, the Midship 25 features a roomy cockpit amidships that can seat up to eight, two cabins for extra privacy, two heads (one with a shower that can be enclosed), berths for five, a galley, and a dinette table that can be dropped to make a large, wraparound settee. Well built of fiberglass with aluminum spars and stainless steel rigging, she's of light displacement and sails well with a moderate sail plan. 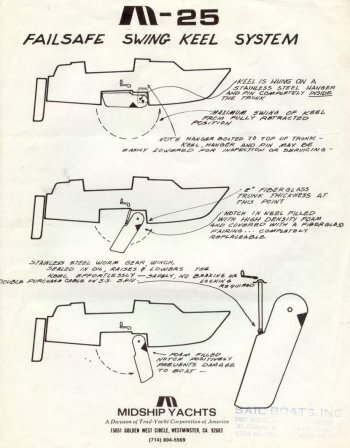 Her keel is easily raised and lowered with a high-powered worm gear and her rudder is retractable, too, making her a boat that is conveniently trailed and readily launched in only 18" of water. She also boasts an important safety factor in that she is designed to be completely self-righting with the keel retracted. 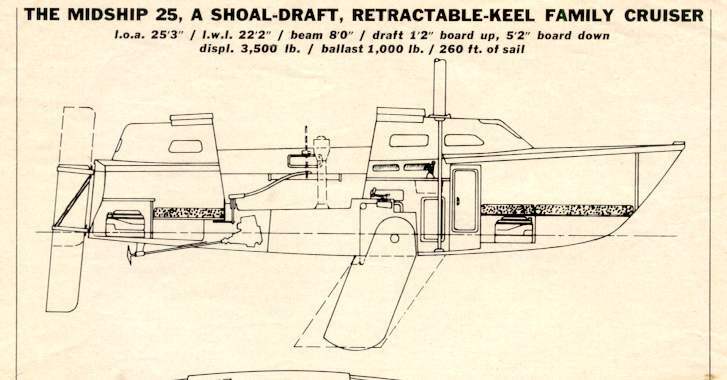 If desired, a fixed keel can be had. The auxiliary power is a single-cylinder Westerbeke Vire of seven hp, that moves her along at about six knots. A Westerbeke DS or Petter Mini-diesel of five hp are options, as is a Baldwin two-cylinder 9 1/2 hp gasoline engine. There is stand-up headroom in the galley, which has a two-burner stove, sink, freshwater pump, an insulated icebox, a 15-gallon water tank, and ample stowage. All interior berths are 6'3" to 6'9" long and the 6'2" cockpit seats can also be used as berths if desired. 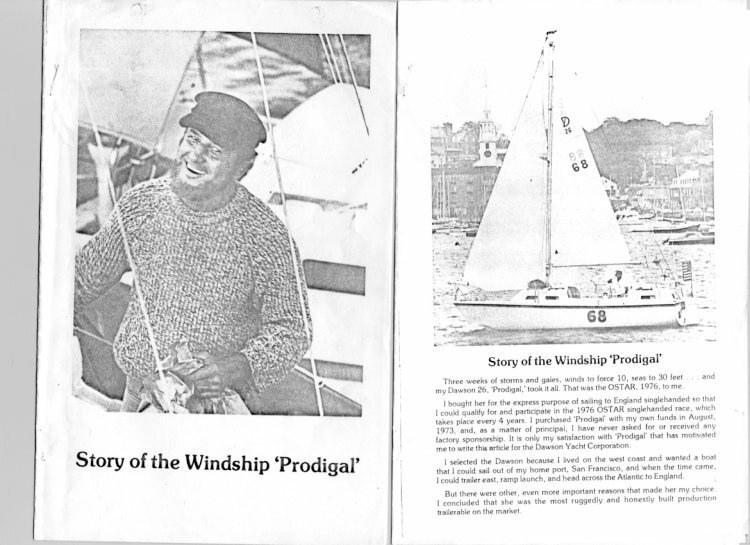 To view an early Midship 25 brochure, click here. 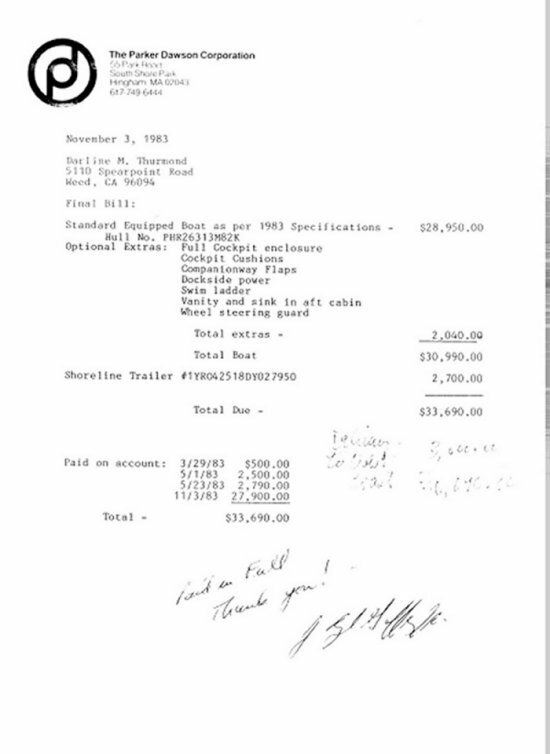 A list of Parker Dawson owners can be found here. To see the story of Hull #68 and how Bob Lengyel finished the 1976 Single handed Atlantic Crossing Race in Force 10 and 30 foot seas here. A copy of the Midship 25 owners manual can be found here. A copy of the Vire 7 owners manual can be found here. See what other people have to say about Midship 25, Dawson 26, and the Parker Dawson 26 here. Visit Tom deLombarde's sailing page here. He is the owner of a Midship 25. 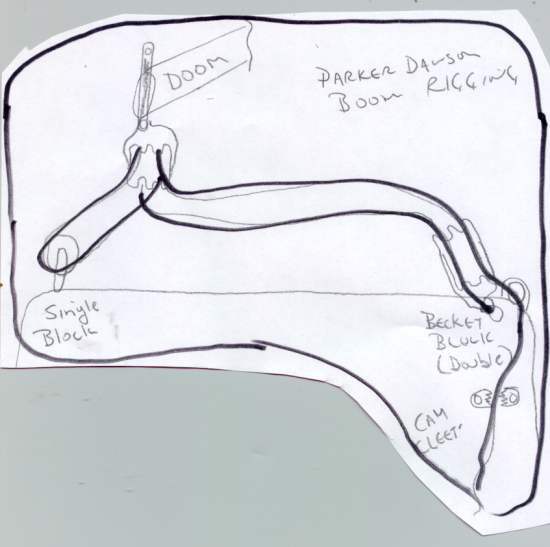 For a view of the swing keel system Here. This Report Just In from Ron Mcpeakehere. If you have any additioal information please email me at. Northstoneave@cs.com; or if you like, please sign my guestbook! Need Boat Letters? Try out this site for great service and a great deal! here. 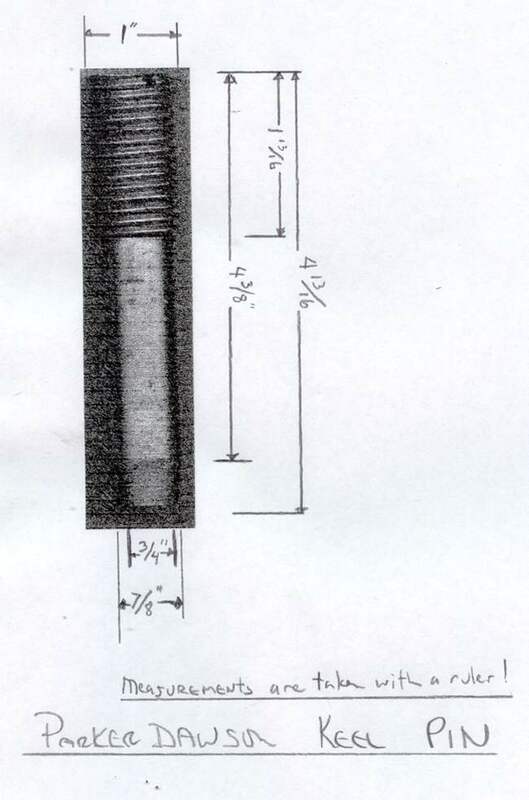 Need the specs for the keel pin?here. 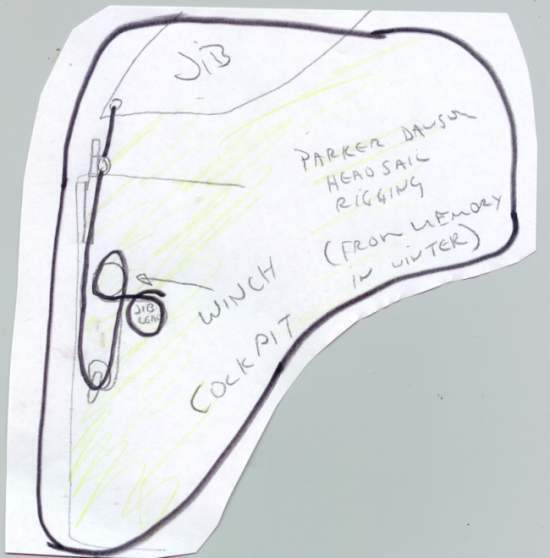 I have tried to remember the rigging for the boom.and the headsail. I'm sure everyone has a preference to the way they rig their sails. This is mine, at least the way I remember it in the winter months. If you have a better way or are better at drawing please send me your version. I will try to get photos this summer. Have you ever seen a Essex Ketch??here. News on the Essex. A great email and a claim to be first. Thanks to J Cherubini II Look here. 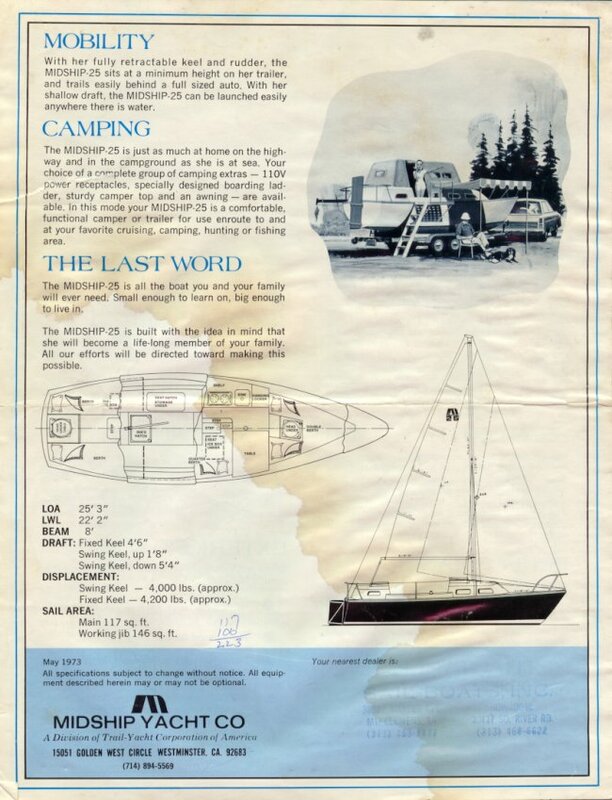 Are you interested in Old Boats? Try the Good Old Boat Magazinehere. To visit the items I have up for auction here. This page owned by John Kenney.